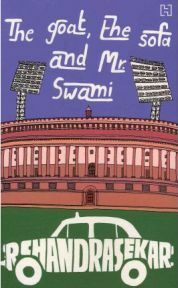 I’m sure that most people probably wouldn’t guess that a book called ‘The Goat, the Sofa and Mr Swami’ is a satirical look at the superficially rather dry topic of Indian politics. Let’s face it, if someone offered you a book about the fictional life of the personal assistant to the Prime Minister, would you really jump up and down shouting “Mine, Mine, Mine” like the seagulls in Finding Nemo? Probably not. That’s a shame because anyone who has even the slightest interest in how Indian politics works would recognize that the fiction is funny but the reality is probably even more bizarre than anything R.Chandrasekar put into his account of a few weeks in the life of the fictional Joint Secretary Swami. Swami is the right hand man of the Indian Prime Minister, a fellow he refers to as ‘The Old Man’. A little like Sir Humphrey Appleby in the classic BBC series ‘Yes, Prime Minister’, Swami is the power behind the ‘throne’, and is a man with intensely creative powers of manipulation which he exercises to protect his master and to promote his own career and self-interest. When he’s in the Old Man’s good books, Swami has more power and influence than most of the politicians in whose circles he moves but the Old Man is a mercurial chap, swinging back and forth between seeing Swami as ‘flavour of the month’ whenever he digs him out of a ditch and ‘persona non grata’ every time anything goes slightly wrong or even if it just suits him to be a bit tricky. The Old Man is 82 years old, in rather frail health, and has an unhealthy obsession with watching a particular digitally-enhanced DVD of a naked dancing girl. When Prime Minister Shah of Pakistan – modern India’s number one enemy – calls up to ask if he can come and watch an India versus Pakistan cricket match, it’s Swami’s responsibility to make sure everything goes smoothly. Setting off one side against the other, engineering disputes, fixing the failures of himself and others, setting up his rivals for failure and ridicule, he’s got his work cut out to keep the peace and stop the wheels falling off the Pakistani Premier’s visit. So where does the sofa come in? The Old Man has a coalition government known as the GNC – Grand National Coalition or Go Nowhere Coalition to his detractors. In order to make everyone in the coalition feel important and to keep them all on side, the Old Man has a cabinet with a massive 173 ministers. Each of these ministers thinks he or she should have their moment in the limelight sitting beside the Old Man and the Pakistani Prime Minister at the test match. Even with a match stretching to five days, it’s just not possible for everyone to rub thighs with the PMs. Swami’s solution is to commission a massive sofa which will enable most of the cabinet to have at least one session sitting with the prime ministers. During one of Swami’s out of favour phases, one of his rivals commissions the creation of a sandalwood sofa which leads to a political crisis over where the wood comes from and whether it’s ethically sourced. The same rival sets up meal for Shah and his party and upsets all the regions of the country whose local cuisine has not been selected, leading to protests, self immolation and ‘to the death’ starvation protests. The same rival – the wonderfully named ‘Fixit Dixit’ (yes, Dixit is a genuine Indian name and yes it does sound a lot like something really rather rude) also tries to set up dance displays only to find that you can’t let one region show off their dancers without letting all the others join in and to give all of them an opportunity would leave very little time for watching cricket. There’s no fun for the Old Man trying to keep all his coalition partners happy when but there’s lots of fun for Swami starting rumours, planting false stories and dispatching his bureaucrat enemies to postings in Mogadishu. The goat is a fine and feisty specimen by the name of Sikander, born and raised in the mountains of Pakistan and destined to be the gift of friendship from PM Shah to the good people of India. This hairy beast with a bad attitude seems a remarkably appropriate gift between enemies. The Indian PM is suspicious that it’s all a trick, a way to get a couple of Pakistani secret service men into India in the guise of goatherds. He demands that Swami find some Indian goatherds who can be sent to collect the beast. After a bureaucrat gets a bit carried away in his attempts to follow official Indian Civil Service guidelines on recruitment, thousands of applicants turn up from all over the country and riots follow. Swami bypasses the process and recalls his enemies from Mogadishu to send them on the humiliating mission to collect Sikander. It’s only appropriate that he gets his comeuppance on the horns of both a dilemma and a goat. R Chandrasekar has packed so much fun into this relatively short book that it sometimes seems hard to keep up as we fly through its pages. Everything that can go wrong does – often more than once. Everything that goes wrong can be fixed – usually in increasingly bizarre and sometimes counter-intuitive ways. As a keen reader of the newspapers whenever we go to India on holiday, it all rang very feasible. The crazy ill-considered ideas, the over the top reactions of the regions and the wheeling and dealing in the corridors of power all seemed entirely believable. You can’t help but love Swami, even as you watch him stoop to ever lower depths in order to get what he wants. He’s the lovable rogue enabling the 82-year old duffer in the Prime Ministerial role to cling on to power. The plots get ever more extreme and at one point we even have the two PMs gambling the future of Kashmir on the results of the game. Chandrasekar writes like he’s having an enormous amount of fun with his characters, pushing them into deep holes and then pulling them out again, challenging the conventional wisdom and playing people off against each other. As far as I know he has no actual connection with the world of politics but that’s no barrier to writing a good book – let’s face it, rather a lot of India’s members of parliament don’t appear to know too much about government either. It helps to know a little about how India works, about the geography of the country and the traditional rivalries. Knowing a few basic words of Hindi won’t do you any harm either and I would put myself in that category. I’m certainly not the born and bred Indian for whom Chandrasekar wrote this story and whilst I think I got more out of it than someone who’d never set foot in India might have done, I do believe you can have a good laugh and be well entertained without any background knowledge at all. You can track down a copy on Amazon and whilst you’re at it, maybe add R Chandrasekar to your ‘one to watch list’. My copy was kindly supplied as part of a box of assorted delights sent to me by the lovely people at Hachette India for which I am very grateful. No Comments on "The Goat, The Sofa and Mr Swami"
Koshkha has a busy international job that gives her lots of time sitting on planes and in hotel rooms reading books. Despite averaging about 3 books a week, she probably has enough on her ‘to be read’ shelves to keep her going for a good few years and that still doesn’t stop her scouring the second hand books shops and boot-fairs of the land for more. At weekends she lives with her very lovely husband and three cats, but during the week she lives alone like a mad spinster aunt. She will read just about anything about or set in India, despises chick-lit, doesn’t ‘get’ sci fi and vampire ‘stuff’ and has just ordered a Kindle despite swearing blind that she never would.